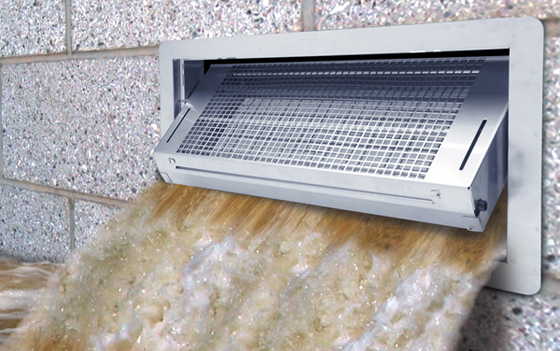 FEMA-approved flood vents like this Smart Vent® model are designed to remain closed until a rising water level triggers an auto-opening mechanism. The open vent won’t clog with debris like a screened vent. Up till now, most crawl space advice on this website has focused on crawl spaces that are located away from flood zones. Now it’s time to put our attention on how things change when your crawl space is located in a flood-prone area. Getting the details right can help avoid major property damage during a flood. The rest of the time, recommended safety measures might help lower your flood insurance rates. A visit to the website of the National Flood Insurance Program (NFIP) will provide you with plenty of information about flood risks in your area and corresponding flood insurance rates. But the website isn’t strong on the crawl space sealing and insulation details that are compatible with flood protection measures. That’s what this blog is about. Flood waters have enough power to severely damage and even destroy a crawl space or basement foundation. That’s why you’ll see many coastal homes elevated on pilings or fitted with “break-away” walls. These lightweight walls are designed to be washed away during a flood, leaving the piling foundation in place. During a flood (especially the storm surge that occurs in seaside areas), a fully sealed crawl space is more vulnerable to damage than a crawl space with open vents that allow flood waters to flow through the foundation. The flow-through function allows pressure to equalize on both interior and exterior sides of the foundation. With a sealed (encapsulated) crawl space, you have high pressure against the exterior wall and no resisting pressure from the interior –a recipe for foundation collapse. 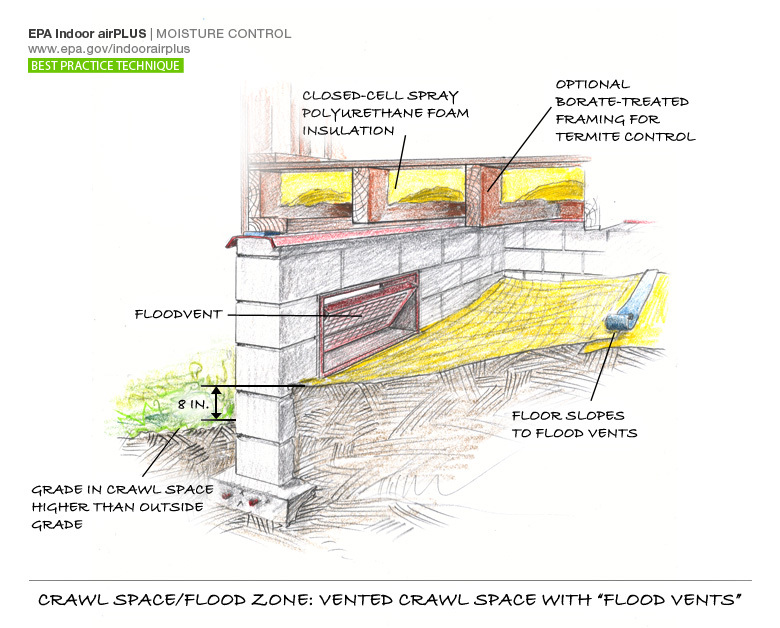 A crawl space foundation located in a flood zone should have vent openings so that flood waters can flow through the foundation instead of beating against it (see drawing). But a screened vent won’t work because debris will accumulate against the screen and block water flow. You can solve this problem by installing FEMA-approved flood vents. Available in screened or insulated models, flood vents are designed to remain closed until a rising water level triggers an auto-opening mechanism. The open vent won’t clog with debris like a screened vent. When you have a crawl space foundation in a flood zone, it’s usually better to forego foundation wall insulation in favor of insulation installed between and/or just beneath the crawl space ceiling joists. In fact, it’s advisable to have all insulation, wiring, ductwork and HVAC equipment located above the Base Flood Elevation (BFE), as defined by FEMA. In addition, there should be a way to drain water out of the crawl space –and active system (sump pump) or French drains that drain by gravity to the exterior. The drawing shows closed-cell spray foam installed between crawl space joists. This is an effective way to establish an effective air and thermal barrier above the BFE. But you could also achieve this goal by installing fiberglass batt insulation between crawl space joists, and then covering the bottom edges of joists with rigid foam insulation. The disadvantage to the “batt-and-board” approach is that if the fiberglass gets wet, it will have to be removed and discarded. This graphic from the U.S. Environmental Protection Agency illustrates a recommended approach to treat crawl spaces in flood zones. Flow-through: Install flood vents that allow flood water to flow through crawl space vent openings. Drainage: Have a drainage system to clear water from a flooded crawl space. Comfort & energy efficiency: Insulate & air-seal the crawl space ceiling. Locate ductwork, HVAC equipment and water heater above the Base Flood Elevation. Wind & water reinforcement: Use approved hardware & reinforcing techniques to create a continuous load path from the foundation to the roof framing. Is homeowners insurance & flood insurance more exspensive with a crawlspace vs concrete slab?